The burgeoning RNAi sector is one of the most watched markets in the pharmaceutical industry. Mechanisms of RNAi (ribonucleic acid interference) are being extensively explored in biological applications. The global RNAi technology market holds significant opportunities due to the promise of RNAi therapeutics in often-fatal diseases such as cancer, cardiovascular, autoimmune, neurodegenerative, and others. Growth of the RNAi research tools and reagents market is being driven by its major applications in therapeutics, diagnostics, and agriculture. BCC Research recently performed an extensive analysis of RNAi technologies, applications, and global markets. On the basis of its findings, BCC projects the overall RNAi technology market to be worth $392.6 million by 2020, with a compound annual growth rate (CAGR) of 8.4%. Within this domain, two markets (RNAi research tools/reagents and RNAi diagnostics) are evolving nicely. The US market for RNAi tools and reagents reached $192.7 million in 2014. The market may be valued at around $315.2 million by 2020, rising at 8.4%. The non-US market could rise at a CAGR of 8.3% through 2020, to reach a value of $75.8 million. The United States held 80.4% of the global RNAi market for research tools and reagents in 2014. In the agriculture sector, arctic apples from Okanagan Specialty Fruits, Inc. were recently approved for sale in the United States and Canada (February and March 2015, respectively). It would be feasible to predict a market for this segment after the commercial availability of the product is established. 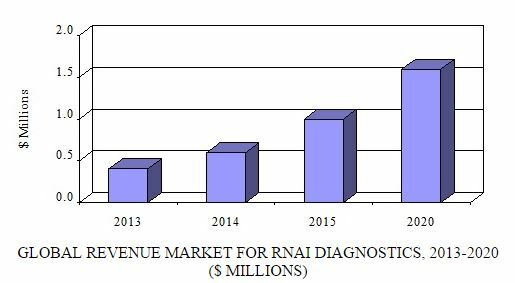 A very small market exists for RNAi diagnostics, which is anticipated to grow with the emergence of additional commercially available diagnostic tests during BCC Research’s forecast period. There are currently no approved RNAi therapeutics on the market. However, various RNAi therapeutic candidates are demonstrating success in advanced stages of clinical investigations. Furthermore, the availability of RNAi diagnostic tests offers great promise for the successful application of RNAi therapeutics and diagnostics in medical settings. If RNAi therapeutics are successfully commercialized, it would bring about a revolution in the medical sciences and reveal a new dimension in the development of therapeutics for fatal diseases. Advancements to encourage further progress in the application of RNAi in agriculture. For the medical community, RNAi offers immense opportunity due to the fact that it could inhibit the translation of disease-causing proteins at the source and have appropriate target specificity for the protein of interest. “RNAi offers rapid identification of specific disease targets from various molecular classes. Numerous studies demonstrate the wide array of prospective applications for RNAi therapeutics,” says Dewan. The demand for therapeutics to treat illnesses such as cancer, neurodegenerative conditions, and rare and infectious diseases, is mounting, as patients are left with no curative options. RNAi has shown that it can offer superior specificity and flexibility compared with traditional biologics or small-molecule drugs. A major challenge for RNAi drug development is identifying delivery strategies that can be used in clinics and for diagnostics. RNAi agents such as small/short interfering RNAs (siRNAs) and short hairpin RNAs are commonly used in the development of therapeutics. After target identification and validation, delivery of the RNAi reagents successfully into the target cell for gene knockdown is the most challenging task. This is due to degradation of siRNAs, off-target effects, stability issues, and other factors. There is a need for robust, flexible, and effective delivery technologies, such as systems that can be customized for diverse targets, conjugate systems with flexible modes of administration, and lipid/polymer/nanoparticle-based delivery systems with improved cellular uptake and various other elements. Systemic RNAi delivery poses greater challenges than local or loco-regional delivery of siRNA. Various mechanisms, such as physical, vector- and carrier-based RNAi delivery systems, are being developed for appropriate delivery of RNAi agents to the target of interest. At this time, the United States can be considered the RNAi hub. The majority of R&D activities in RNAi therapeutics take place in the United States. 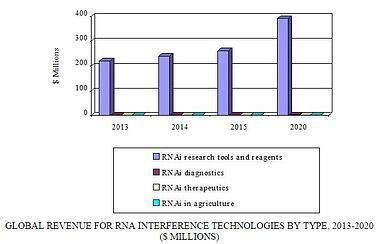 However, the market for RNAi technologies is expected to grow with enhanced research throughout the United States, Europe, and the rest of the world (ROW). Although most RNAi reagent and research tool companies are based in the United States, the prospect of RNAi technologies is attracting European as well as Asia-Pacific companies. Regional breakdown is feasible for the RNAi research tools and reagents market, as well as for the RNAi diagnostics market. The markets for RNAi therapeutics and RNAi agriculture technologies are not yet mature. The United States has the majority of market share, as it hosts most of the reagent companies (e.g., Thermo Fisher Scientific, GE Healthcare, Dharmacon, and Sigma-Aldrich). In addition, R&D for RNAi therapeutics is mainly accomplished in this region because of funding availability and upgraded facilities. However, companies and institutions in ROW are also doing notable therapeutic research. The forecast period will be an important gauge of how the market is doing with many of the RNAi candidates in the pipeline. Merck KGaA’s acquisition of Sigma-Aldrich in September 2015 should benefit all regions in the RNAi research tools and reagents domain because of Merck’s strong global reach. Other regions are also making valuable contributions to the RNAi market. For example, Israel-based Rosetta Genomics and Denmark-based Exiqon A/S are pioneers in RNAi diagnostic technologies. Furthermore, various RNAi-based research efforts are being conducted in the Asia-Pacific regions. Thus, the budding market of RNAi is benefiting from activities being performed worldwide. Successful clinical trials of RNAi therapeutic candidates that are in advanced stages of development would likely spur market growth globally. Overall, the market should demonstrate modest growth through 2020 with the successful utilization of RNAi techniques in therapeutics and agriculture. BCC Research’s RNAi Technologies and Global Markets provides a complete analysis of global market drivers and trends, with data from 2014, estimates for 2015, and projections of CAGRs through 2020. The report presents the details of therapeutic candidates along with prospective applications of RNAi in diagnostics and agriculture.